always rely on the trusted name of Blackhorn 209. What a feeling it was to shoot a 265 lb. Canadian black bear at 60 yards right between the eyes. 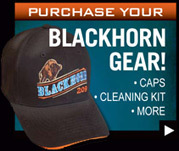 Blackhorn 209 is definitely all I need for performance."